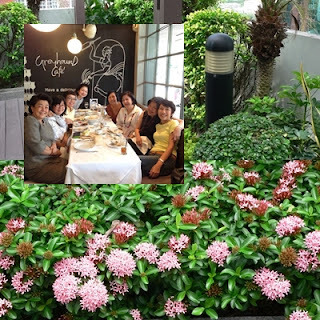 I had a nice lunch with my old school mates one Saturday during my stay in Thailand. We spent years together in this all girl school, once well known for its academic fineness and discipline. Nobody listened to anybody, I can tell you and this was one of my happiest moments in Bangkok this time round. Some of us had not seen each other for 20 years so you can imagine the noises we made. After lunch, we retreated to one of the girls’ condominium nearby. It is on the 21st floor of the up-market block. The owner (she was our school prefect) bought the unit a decade ago and out of 200 square metres total space, 120 square metres are this garden. Out in the garden, one can believe it is not in the middle of the concrete jungle as the greenery helps foil the harshness of the city skyline and the bonus is the flowers, just like this ixora in full bloom.